LIA Quest 1: Mecha Sound! During LIA Cast 67 we announced the LIA Quests, a new interactive creative challenge and feature of the LIA Cast. Much like our Curveball segment, we throw out a small challenge at each other (and you, the Leaner) to get our creative motors running. We then share the results on the following LIA Cast. Check out LIA Cast 67 for the full details, but here's the gist of Quest 1. And here's my entry for the Heroic Challenge portion of the quest. 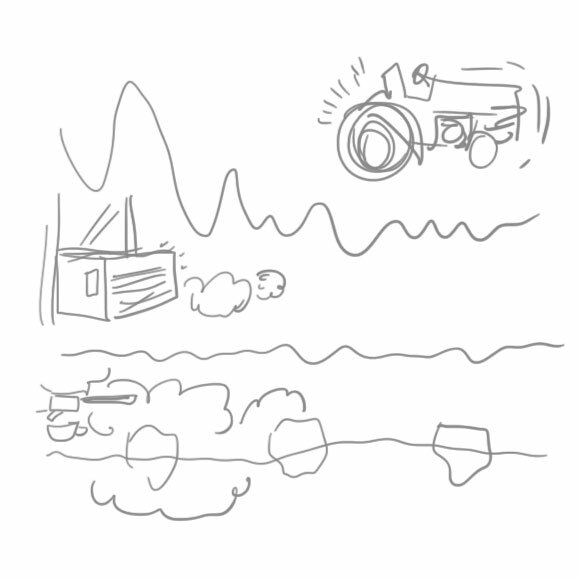 I began by sketching out the sounds' rhythms in Photoshop. I'm not worried about spelling or styling yet. All I'm concerned with is the cadence, volume, and pacing of the sound as I speak it aloud. You can see that in the case of the espresso machine, I was making little "puffs" as a note to myself that the sound is a fairly consistent hiss punctuated by larger bursts of sound. 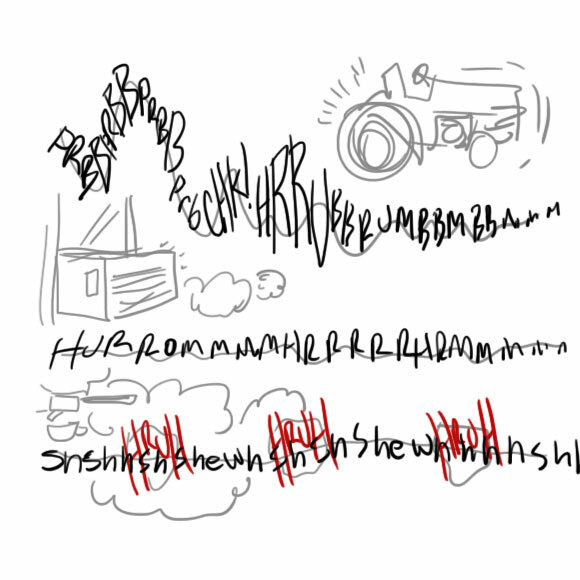 I then sketched out the sounds themselves. Now I'm mostly concerned with the spelling, though I'm thinking a bit about how the size and orientation will contribute to the rhythm. The lines I started with in the first draft are a great cue for that. I then imported this file into Adobe Illustrator (with which I do 99.9% of my final sound design), and started the final draft. The air conditioner sound gave me some trouble. My original thinking was a large, open font for the design. But it felt too loud and present, at least in this context. So I did a second version with a lower case font to see if I could push it back a bit. For colors I chose a slight pink to warm-ish blue gradient, figuring that an air conditioner doesn't make arctic temperatures, but it cuts through the summer heat a bit. This brings me to the colors of the espresso machine and the tractor engine. For the tractor I went with rusty reds and yellows. The yellows would be used for the higher-pitched points of the sound, while the reds might reflect the low gravelly sounds of the motor. I associate yellow with high-pitched sounds, apparently, because I chose that for the hiss of the espresso machine. But for the lower-pitched "hruhs" I went with a white-to-blue gradient, both for contrast and to imply the sound of air pressure being released in one big burst. Fonts used: Three of my own custom fonts and Comicrazy. We'll talk more about this, as well as your entries, on LIA Cast 68. Join us Thursday, January 17 at 9:00 pm ET! Looking forward to seeing the results of your quest. Remember that you can share them on Twitter or Google+ by using the #liaquest1 and #liaquest tags. More info in the LIA Cast 67 post. And for more on this sound design stuff, you can check out my workshop FTAM! Designing Sound Elements. It's 4 hours of video packed to the gills with sound design philosophy and how I put it to use in a vector program like Adobe Illustrator.